Home Smoked Sockeye Salmon with Ginger Lime Dirty Wild Rice and Grilled Asparagus. It’s really easy to Smoke your own Fresh Salmon at home, with a lot less Salt and Preservatives than the stuff you buy at the store. Perfect for Valentine’s Day or Any day. Plus a Grilled Vegetable Dirty Wild Rice recipe you can make on the Grill. Video is dedicated to February National #HeartAwarenessMonth, Combine with #ValentinesDay and try this Home #Smoked #Salmon & Wild Dirty Luv #Rice #Recipe. Season cleaned Asparagus with Butter, Herb, Spice Mixture and set aside. Place Rice Pot and Asparagus on hot side of Grill. Flip and remove Asparagus in 10 Minutes. Allow Rice to cook 20 Minutes (or until soft), then remove from Grill. Also remove Salmon once it has Smoked about 1 Hour indirectly on Grill. Place Rice in Buttered Ramekin for presentation. Serve with 4oz. Smoked Salmon (with Lemon), place 6-8 Grilled Asparagus per plate. Finish with final Sprinkling of Spice Rub and Chopped Red Bell Peppers (for color). 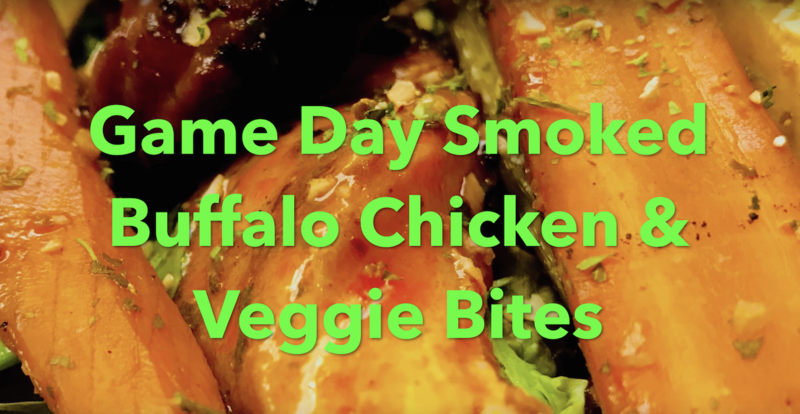 It’s Game Day and as much as you Love traditional Buffalo Wings- try this Recipe, you’ll like it even better. We use lean Boneless Chicken Breasts and Thighs. Veggie BBQ will also delight Vegans and Omnivores, alike. Thanks to #EchoParkSocialClub for Rocking the Soundtrack. #Luvafoodie‘s Salt-Free Citrus Lovers Blend is perfect for Recipe. Also, True Made Foods All-Natural Vegetable BBQ Sauce makes a Big Play. This is limited Recipe Video, stay tuned Short Film with Rock Star coming soon. BBQ RESCUES Foundation, Inc.
1. If you are expecting Vegans, better to prepare Vegetables separately on Grill and keep warm before cooking Chicken. 2. Prepare Grill for Indirect Smoking by heating one Half to High (Gas or Charcoal). Soak Wood Chunks or Chips. 5. Combine All in Plastic Bag (or in Bowl). Mix in 2 oz Worcestershire Sauce and 2 Tbsp. BBQ Dry Rub or Seasoning. Mix well and Smoke on Indirect side of Grill, after adding Wood Chunks or Chips for 15 Minutes, flipping once. 10. Place Grill-Safe Pan on Hot side of Grill. Add Franks Hot Sauce, Butter and Sugar Substitute. Mix Well and Cover. 11. Once warm (about 10 Minutes), Stir and remove Sauce Pan from Grill. 16. Slice Grilled Chicken into thick Strips and serve on other side of Platter. 17. Finish with a final Sprinkling of BBQ Rub or Seasoning. Preheat Oven to 4:40 Degrees. Cook Veggies for about 15 Minutes, flipping once. Chicken should cook for about 40 Minutes, flipping until browned. *Note- Video was produced by BBQ RESCUES Foundation, Inc. in the interest of Healthier Grilling and is Non-Sponsored. 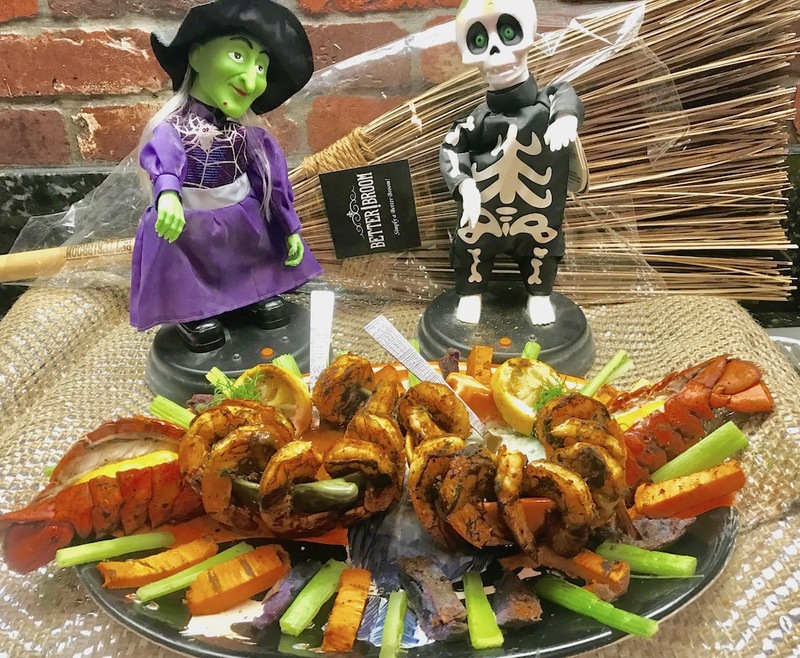 Grilled Shrimp and Lobster with BBQ Cocktail Sauce, Green Spirulina Tarter Sauce and Grilled Veggie Sticks. If you are reading this, you are probably among the growing number of Americans who are trying to take better care of themselves, which includes increasing exercise and eating a bit healthier, This can also include Grilling BBQ with Leaner Meats, Seafood and adding plenty of Veggies at every meal. For Halloween we thought it is the perfect time to do a Recipe introducing Spirulina. No it’s nothing scary, but a delicious superfood supplement said to be the most “Nutrient Dense Food On the Planet”. Give it a try and see what you think. 1. Clean and Marinate Shrimp and Lobster in 2-4 Tbsp BBQ, Salt, Pepper, 2 Tbsp Lemon Juice and 3 Tbsp Fresh Chopped Dill. Then place on Skewers on flat sides. Grill in Smoker 6-8 Minutes per Side until they turn white. 2. May wrap Potatoes in plastic and precook microwave for 5 minutes to make easier to cut and Grill faster. Slice into 1-1/2”- 2” Slices. Season with BBQ Seasoning, Salt, Pepper and optional Fat Free Greek Dressing. Grill on Smoker for 10 Minutes per side, until tender. Then cut on long side Slices into 1-1/2” Dipping Strips. 3. Grill Lemons in 2” Slices and marinate cleaned Celery Stalks. Grill them whole for 3-4 Minutes per side. Want to add Char but not cook them soft. Cut Celery into Sticks after removing from Grill. 4. Add all Ingredients for each Red and Green Sauce in separate Bowls. Whip each into blended smooth, with solid colors. 5. Place bowls in center of large Platter, Give a final squeeze of fresh Lemon Juice and garish each bowl with Grilled Lemon Wedges. Add a few Shrimp around the rim of each Bowl. Garlnsh with alternately colored Veggie Sicks and Half Moon Slices of Grilled Lemons.